Another bright, sunny day, though a little cooler. Still on the right side of zero, though. We got another little blizzard a week ago yesterday; it melted quickly but did cause a few fender benders. It must have had an effect on trick-or-treaters, because we didn’t get a single one on Hallowe’en. We got an e-mail from Lois Drobot, formerly of Greenwater, saying that Mel Rauckman died Monday, October 26th. Mel and Veronica ran the boat house called The Tackle Box at Greenwater for many years, and after selling it continued to reside at Greenwater until a little over a year ago, when they moved to Porcupine Plain. Mel battled ill health for several years. Our condolences to Veronica and her family. Mel Tkachuk is going to particularly miss Mel Rauckman – they used to do a lot of fishing together. Condolences to you, too, Mel. We went to a nice presentation at Knox United Church on Friday evening. It was called KNOX Radio and imitated a live radio broadcast from Saskatoon in 1949. There was an excellent orchestra and quite a few singers, male and female, doing music from that era. In between musical numbers, there were advertisements and news items from November, 1949. Many of the ads had musical accompaniment –remember the Brylcreem song? “Brylcreem, a little dab’ll do ya”. The church has good acoustics; there were a couple of mikes but I noticed the singers stayed about three feet away from them. As a result, there was no electronic distortion; I was able to enjoy the music and understand every word. We, of course, were the Studio Audience. Out in front of the stage were two young girls with big signs that said “Applause”. They would jump up and wave the signs around after every number. We didn’t need the signs as applause came easy, but the kids sure were cute. We met Dale and Mildred Morrison there, and had a nice visit with them. Dale was a very popular United Church minister at Wynyard back in the sixties. They live in Saskatoon and have for many years. They have tried retirement, but I understand Dale still ministers to a rural congregation. The temperature got up into the low double-digits on Friday, so Doreen cracked the whip and we put up our Christmas lights, a few on the east deck and a few more beside our patio. No ladder required and the whole job didn’t take half an hour. We haven’t turned them on, of course – I usually hold out for Christmas Eve for that, but Doreen figures any time after December 1st is okay. She usually wins. Saturday was a busy day for us – at least for the first part. 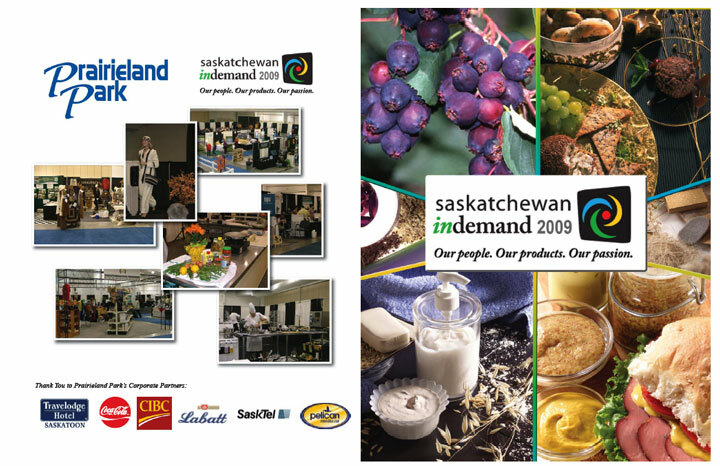 We had breakfast with our Sunseeker buddies at the Travelodge, then went to Prairieland Park for a “Made in Saskatchewan” exhibition. Flax and alpacas seemed to be the biggest part of the show; I had a very interesting visit with Ted and Laine Walker. Laine spins flax and weaves it into some beautiful flax/cotton material. Laine and Ted are also our newest neighbours, here in Berini Court. Right beside their booth was a booth dealing with harvesting flax and separating the linen; also on making use of the fibrous material that is not linen. Since it wasn’t busy, I was able to visit with a man who explained how it is harvested for its fibre. A combine with a special header first strips the seed pods; then the straw is rolled, which uproots it and lays it on the ground. It stays there until partially rotted then is raked and baled. A processor then pounds the straw to break down the non-linen part and the linen fibres are combed out. How fine it is combed depends on how the linen is going to be used. For spinning, it is combed very fine; for insulation, less so. The coarse material is used for ground cover under shrubs, etc. or as a binder with resin for various products, including shingles. Linen has been in use at least ten thousand years; the Egyptian mummies were wrapped in linen. Apparently it is very resistant to vermin and bacteria.